Follow me on Twitter: @vivekprahlad. 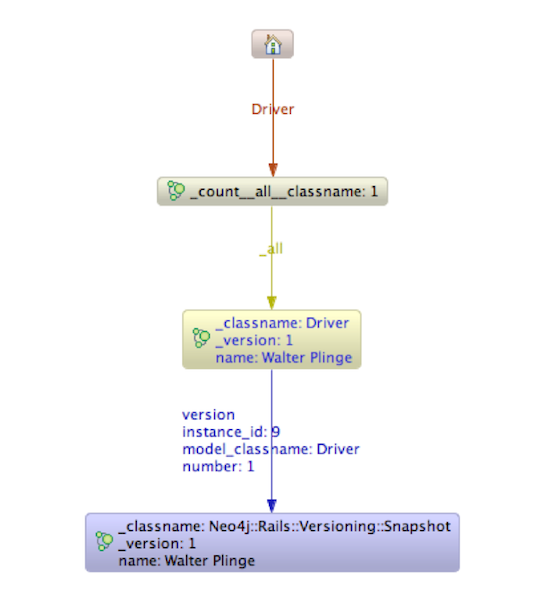 Versioning creates snapshots under a given rails model instance. 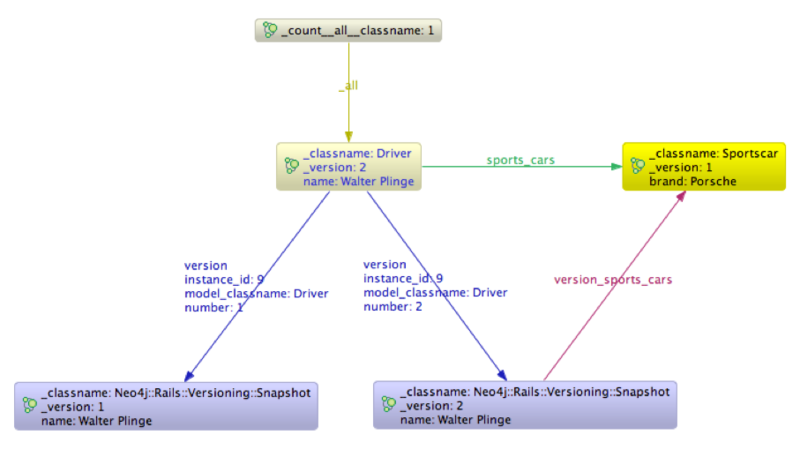 Note that snapshots aren't Rails models, but vanilla nodes. The relationship from the instance to its snapshot versions captures information about the snapshot, such as the version number, the class that is being versioned, and the id of the versioned model. When asked to retrieve a particular version of an model, the versioning module internally does a lucene search using all of these parameters. Snapshots currently capture all the properties of an instance. The snapshots create links to the same nodes that are linked to an instance, with one important difference. The snapshot's relationships all have a 'version_' prefix - the prefix is added in order to distinguish between 'regular' relationships and those created for versioning. Both incoming as well as outgoing relationships are recorded. With version 2, we link the driver to a sports car - a Porsche. 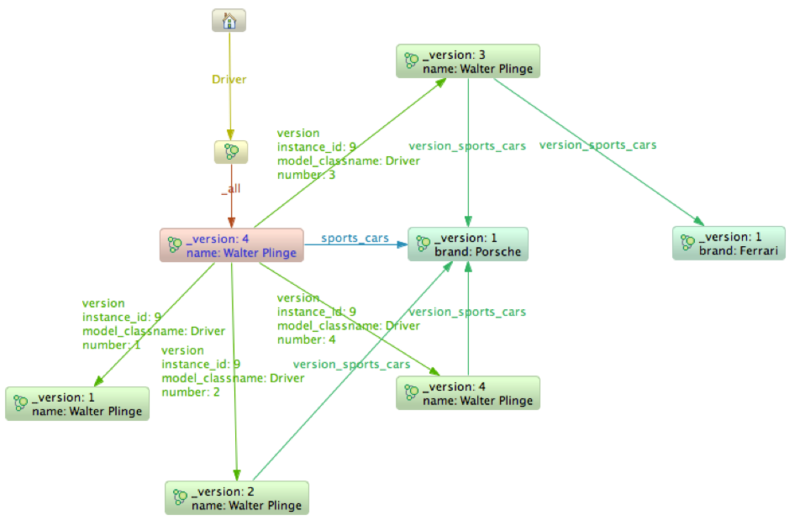 Now, both the driver and the current version are linked to the Porsche. 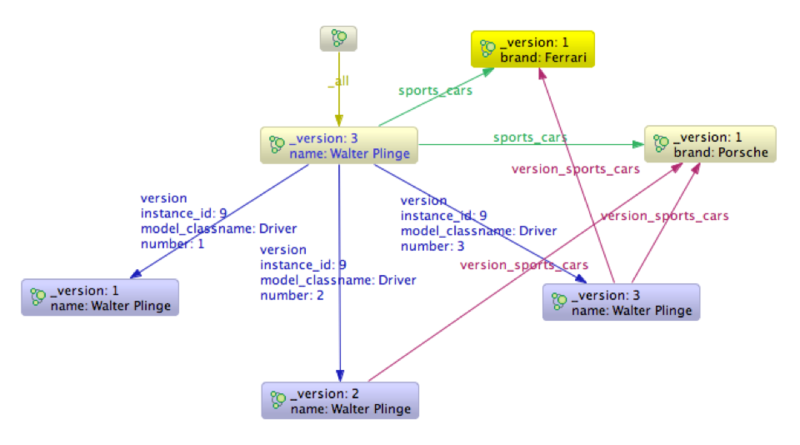 With version 3, we link the driver to a second car - a Ferrari. The graph now starts getting complicated. The driver, as well as the latest snapshot, are both linked to two cars - the Porsche and the Ferrarri. To retrieve a snapshot, you'll need to call the version API. 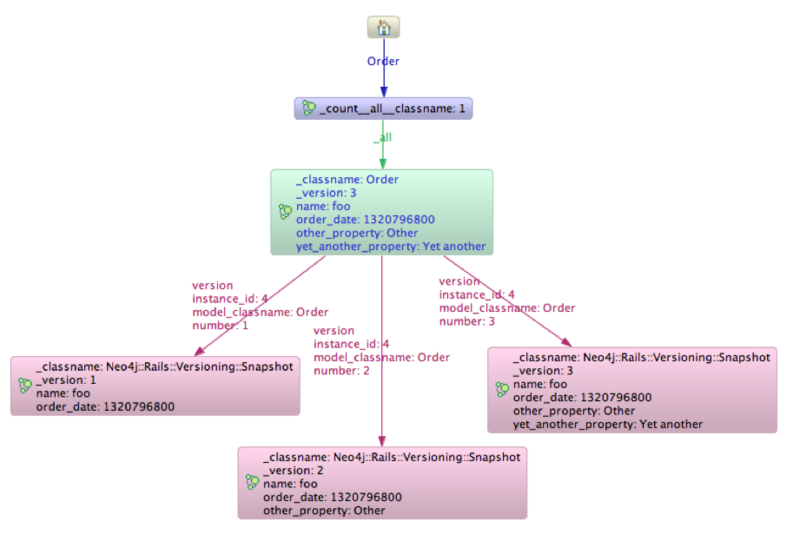 The snapshot object will respond to the exact same properties as those on instance. It also allows relationships to be traversed using the incoming / outgoing API. The prefix stuff I'd mentioned above is handled transparently, so you can continue to use the same relationship names that you've used in your model.